Insulin binds to receptor on target sites. These sites have an intrinsic tyrosine kinase activity that lead to receptor autophosphorylation and recruitment of intracellular signalling molecules. The latter result in widespread metabolic and mitogenic effects of insulin as shown in the diagram above. Another effect is the activation of phosphatidylinositol 3 kinase that fastens the translocation of GLUT-4 containing vesicles to the cell surface. This is important to allow uptake of glucose by skeletal and fat cells. When insulin action ceases, the transporter-containing patches of membrane are endocytosed and the vesicles are ready for the next exposure to insulin. On the other hand, in the liver, this is not the mechanism of glucose uptake. 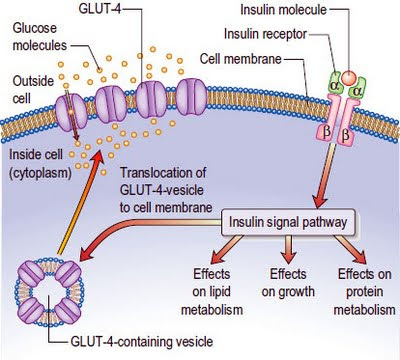 Instead, it induces glucokinase, and this increases the phosphorylation of glucose, so that the intracellular free glucose concentration stays low, facilitating the entry of glucose into the cell by diffusion. Insulin-sensitive tissues like muscles also contain a population of GLUT 4 vesicles that move into the cell membrane in response to exercise, a process that occurs independent of the action of insulin. This is why exercise lowers blood sugar.